The Great Seal is also known as the Coat of Arms used by the United States Government. From the eagle's perspective, it holds a bundle of 13 arrows from it's left claw, which refers to the original 13 states and with the olive branch in it's right claw symbolizing that the United States has "a strong desire for peace, but will always be ready for war." The 13 stars over the eagle's head also represents the original states. 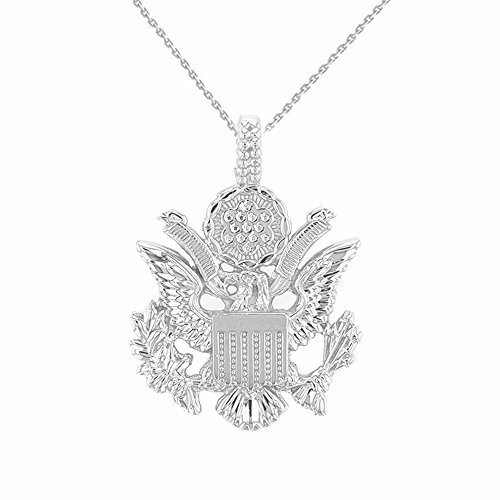 This lovely pendant is an excellent gift to wear to show your true American Honor. If you have any questions about this product by American Heroes, contact us by completing and submitting the form below. If you are looking for a specif part number, please include it with your message. Rembrandt Charms 10K Yellow Gold Anchor in a Circle Charm on a Rope Chain Necklace, 18"
Rembrandt Charms 14K White Gold Russian Eagle Charm on a 14K White Gold Box Chain Necklace, 20"